Where To Buy Red PVC Tablecloth? Red is certainly proving the colour for all seasons and works perfectly as a PVC wipe clean tablecloth. We offer an extensive range of red PVC vinyl tablecloths which are perfect for those busy homes. Whether you are searching for a red and white traditional gingham wipe clean tablecloth or perhaps a vibrant red and white polka dot spotty PVC tablecloth. Whichever style of red tablecloth you are searching for we have you covered. 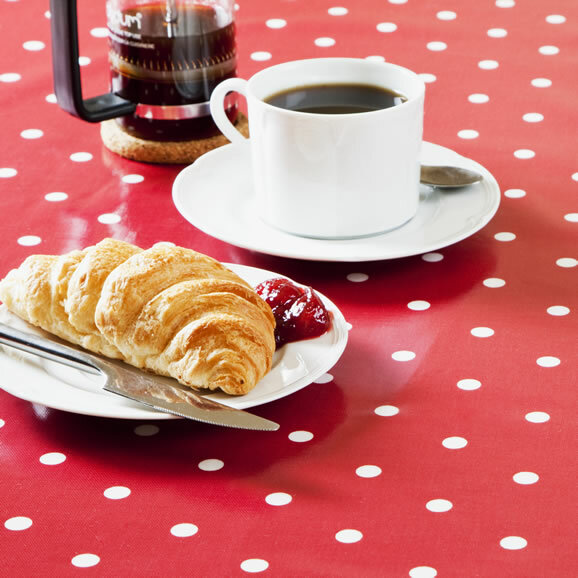 If our red PVC tablecloths aren't for you then be sure to take a look at our range of red oilcloth tablecloths. Does PVC Tablecloth Need A Hem? This is a question that we are asked frequently and the simple answer is no. As all our Oilcloths are Wipe Clean Tablecloths they have a coating which in turn stops them fraying as a traditional cotton tablecloth would do. However, lots of customers want a finished edge on their tablecloth so we offer this as a service by sewing a bias-binding finish on your cloth. This is not the only optional extra that we offer as we also offer parasol holes for those outdoor tables as well as rounded corners. If you can't see the size that you require here then we can make to order extra-wide tablecloths or even cut down tablecloths to meet your needs. Still not found what you are after then please contact us and we will be happy to help.